Dr Eugene Wyborney was a great grandson of Jan(*1811) Vyborny. In his later years he actively pursued an interest in Vyborny genealogy, corresponding with and visiting family members throughout the United States. In so doing he acquired a large store of information, particularly as related to the Jan(*1811) and Josef(*1828) families. He produced detailed family trees that contained many hundreds of entries. Dr. Wyborney also collected stories and news clippings related to family members. These he had printed under the title of "Vyborny Vignettes" -- although with characteristic modesty, the collection does not identify him as the author. Below is excerpted text of a newspaper clipping about Dr. Wyborney that appeared in "Vyborny Vignettes" taken from the Port Angeles Times on March 2, 1961. After 10 years of general practice in Port Angeles, Dr. Eugene Wyborney left Wednesday for fulltime medical work with mentally retarded people at Lakeland Village near Spokane. A state school founded in 1914 Lakeland Village now has an enrollment of 1500. Dr. Wyborney will be the first full time physician. Dr. Wyborney's interest in retarded people has grown steadily over the past 10 years. He has been active for six years in the Washington State Coordianting Council for Exceptional Children. Objectives of the group were to coordinate the efforts for education of exceptional children regardless of their handicaps. He has also been a director of the Washington State Heart Association for three years. Eugene Henry Wyborney was born at Bridgeport near Chief Joseph Dam, February 9, 1912. He attended Washington State College majoring in forestry and range management until his senior year when he changed to premedicine. In 1938 Dr. Wyborney graduated from the University of Oregon Medical School in Portland. He completed his general internship at Santiago County General Hospital in 1939. He then became resident physician in tuberculosis and chest medicine at Maryknoll Sanitarium where he stayed for 15 months. For the next six months he was at Riverside County Hospital. The next years 1941 to 1946 were confined to military service. After a course in tropical medicine at Tulane he spent 23 months overseas in the Central Pacific area. Dr Wyborney says that his military assignments were divided between doing internal medicine in the receiving room and administration. He was admitting officer for the 36th Field Hospital attached to the 77th Infantry Division. "We went through four campaigns, the Marshall Islands, Guam, Leyete Gulf and Okinawa. On our biggest day we had 245 admissions in 24 hours. I saw them all myself and put them into a 400 bed hospital that was already full." It was at Leyte during an air raid that Dr. Wyborney received a wound that earned him the Purple Heart. 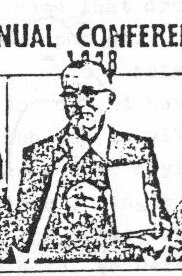 After the war in 1946 Dr. Wyborney became the medical director of Aldercrest Sanitarium in Snohomish County. He was also consultant in chest disease for the State Department of Health. During this period he made regular trips to Challam County. In 1947 he took a years leave to return to Santiago County Hospital for another year as a resident physician. In 1951 he came to Port Angeles to enter general practice. He has done post graduate work at the University of Southern California and the Trudeau School at Saranac Lake in New York. 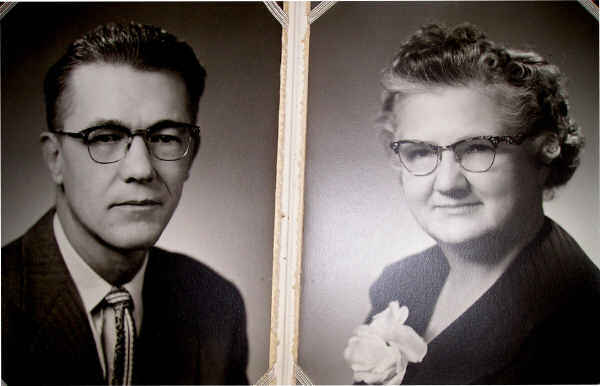 In 1936 Dr. Wyborney married Mary Marilla Blakesley who had majored in music at Washington State College. The Wyborney's have three children. Dr. Wyborney is a Rotarian, a member of the Naval Lodge of Elks and the American Legion. For the past ten years Dr. Wyborney has been the one of the most experienced resident practioners on the North Olympic Peninsula. He leaves a devoted group of patients for a field of activity in which he feels physicians are greatly needed. Dr. Wyborney, after a highly distinguished medical career, pursued his interest in genealogy until his death in 1996. As to the ancestry of his great grandfather Jan(*1811) the only information available to that time was that, according to family tradition, Jan's father was Josef Vyborny. It is now also known that Jan was the great great great grandson of Frydrich Vyborny(*1645) - see the family tree. 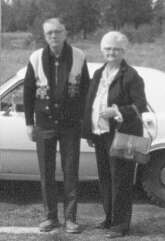 Dr.Eugene and Marilla Wyborney in 1978.